We know it’s the holidays and you may be exchanging wrapped gifts to friends, colleagues and loved ones. Well, don’t forget to wrap your house too! Wrap a house? Yes, your house! 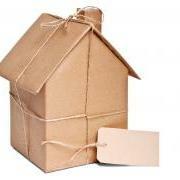 If you are so lucky to receive a house, make sure it is wrapped! Sound ridiculous? Well, we don’t mean gift paper wrap, we mean weather barrier wrap under the siding of the house. Weather barrier wrap, part of the building envelope system, is critical to protecting the building, any building, from water intrusion! In new structures such as homes and condominium developments, house wrap is applied after the external wall sheathing (such as plywood) and BEFORE the windows and doors are installed. House wrap is typically a synthetic/manmade material used to protect buildings and functions as a weather-resistant barrier, preventing rain from getting into the wall assembly while allowing water vapor to pass to the exterior (that’s called permeability). If moisture from either direction is allowed to build up within stud or cavity walls, mold and rot can set in and fiberglass or cellulose insulation will lose its R-value due to heat-conducting moisture. House wrap may also serve as an air barrier if it is sealed carefully at seams. All of these brands have moderately similar installation guidelines, however, and this is very important, in order for the wrap to be warrantied by the manufacturer strict adherence to their specific installation instructions is required. And that is where we see the majority of the problems. When a client calls and complains about water intrusion, if we can’t find an obvious non-invasive reason for the problem, many times an invasive inspection reveals improper installation of house wrap. It’s almost like wrapping the perfect gift! Give a gift to yourself! Whether you are building an entire condominium complex or a new home, ensure the architect has specified the type/brand of wrap that will be used. The final siding (brick veneer, shakes, clapboard, etc…) of the building often will dictate the type recommended. Then, talk to the contractor about their familiarity with using the specified wrap and ensure they have been trained and will follow the manufacturers' installation instructions. If you have hired a firm to monitor the construction be sure to discuss this step in detail with them. It will be important that the wrap installation is inspected for compliance before the siding is installed on the building. In fact, make that inspection part of the contract. By the way, each brand has great websites that show the proper installation of their product. Take a moment to educate yourself, it could really pay off! By the way, new house wrap can be applied to existing buildings that are going thru a siding up-lift. Just follow the manufactures direction on how to apply their product to existing structures. Well, we hope that your holidays are safe and joyful. Wrap those gifts, but don’t forget to wrap your house too. Until next time, that’s a wrap!